And now ... to grill them ... mangoes + pineapples ! Below my slightly modified version in blue. With skin, cut cheeks from mangoes. Discard stones. Cut 3 vertical lines and 3 horizontal lines in each mango cheek, without cutting all the way through. Cut pineapple into 6 thick slices. Sprinkle cut side of fruits with some brown sugar. Lightly coat a grill pan with a little oil. Heat the pan over medium flame. Cook the mango, cut-side down, for 2 to 3 minutes or until lightly browned. Remove from grill pan and transfer to a plate. Cook the pineapple for 2 minutes each side or until lightly browned. Lightly roast the pistachio nuts and set aside to cool. Combine and mix well yoghurt and roasted pistachio in a bowl. Serve the grilled fruits with yoghurt mixture. Another way to enjoy these grilled warm juicy tropical fruits served with pistachio yoghurt. Delicious ! This looks delicious Karen, love the new look of your website. Hi Karen, This looks and sounds very healthy. I love mango and pineapple very much. Definitely want to make this for my lunch! Hi, Karen, the grill mango and pineapple are very special to me. I believe this plate of delicious dinner is really very healthy! Thanks for linking up with LTU! You're welcome Jozelyn. We really enjoyed these grilled fruits very much ^-^! Hi Karen! That's an innovative way of eating your fruits - grill them up! I should try this some time. By the way, love your new blog masthead! Hi Karen, interesting recipe, look very delightful. Thanks for sharing. This is something new to me. Different way how we can eat our fruits! Hi Nancy, if you're having some BBQ in your garden/court yard, try some grilled tropical fruits. What a delicious meal! 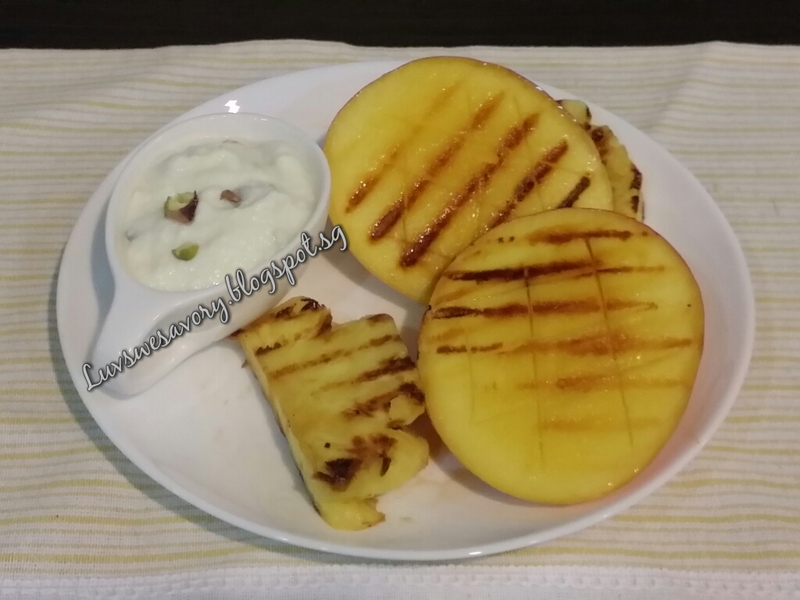 Grilled fruits with yoghurt dip, now that sounds yummy! 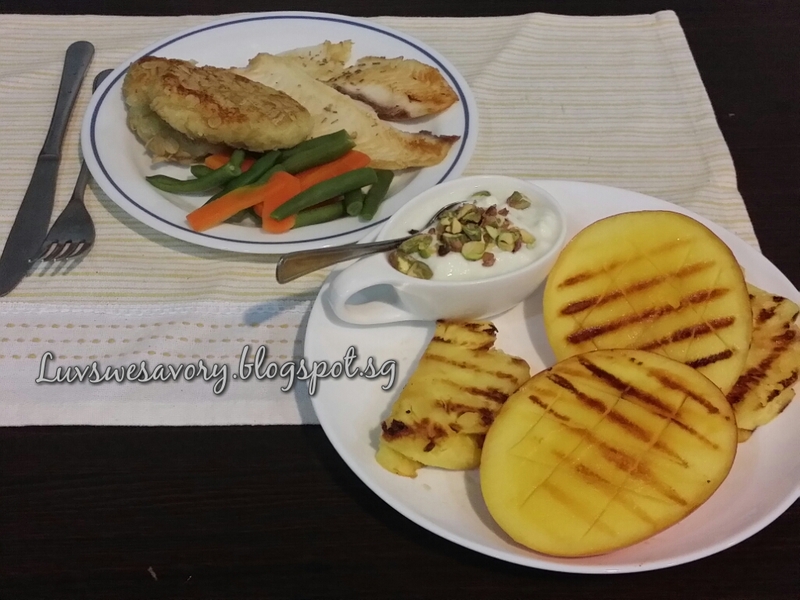 I like grilled pineapples but have not tried grilled mangoes. I think it should be nice too! Hi Lian, do give it a try ^-^!